NEW YORK, NY (September 22, 2015): Located directly on Madison Square Park in Manhattan, Black Barn Restaurant [19 East 26th St New York, New York 10010; www.blackbarnrestaurant.com; 212-265-5959], comes to us from chef and owner John Doherty, formerly executive chef and mainstay at New York City’s Waldorf-Astoria and HITS President and CEO Tom Struzzieri. 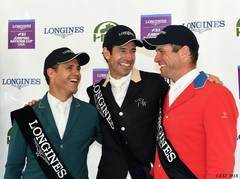 Childhood friends, Doherty and Struzzieri, took separate career paths after high school. 30 years later with seasoned experience in the culinary and equestrian fields respectively, they set out to open a restaurant that combined their passions and expertise in the city they love most. 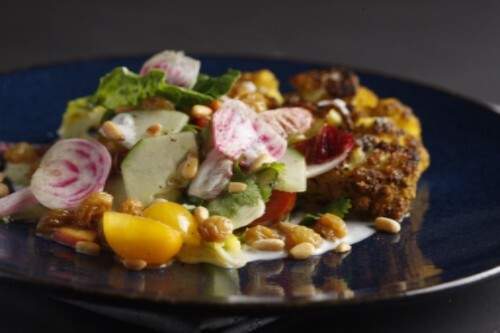 Black Barn offers a seasonal, modern approach to American classics, sourcing directly from local farmers, ranchers, and fishermen. Acclaimed designer Mark Zeff develops a clean, barn-inspired atmosphere reflecting his eponymous BLACKBARN homes in the Hamptons. The menu pairs with a robust wine program in the 88-seat dining room fitted beneath the expansive farmhouse rafters. The menu, executed by chef Matteo Bergamini [Miramonti L’altro in Italy, Daniel, and SD26], begins with shared plates including Mangalista Charcuterie with house-pickled vegetables and toasted sourdough; “Irwin Farm” Foraged Mushroom Toast with robiola, taleggio and purple watercress salad; Pork Belly Chicharrones with apple slaw; and Black Mission Fig Pizza with spicy coppa. In addition, a daily selection of oysters from the Northeast and Washington will be served alongside pours of champagne from their exposed raw bar. Appetizers include Maine Lobster Salad; Grilled Corn Salad with arugula, avocado, and tomato; “Spring Brook” Cheese Souffle with speck and chives; and Bone Marrow with Manila Clams, Lemon-Herb Crumb, and Shallot Reduction. The main courses are divided into four sections: Slow Cooked, Wood Grilled, Ocean and Garden. Options include: “Vermont Shivanne” Farm Baby Goat with rosemary potatoes and braised artichokes; Porchetta with broccoli rabe; Mangalista Collar with cabbage, grilled apples and bacon crumbs; Striped Bass with crispy skin and sorana beans; BBQ Beef Ribs with orange-chipotle rub and shoe string fries; Carrots Escabeche with burrata, coriander and quinoa; and Curried Cauliflower Steak with cilantro raita, toasted pine nuts, and pickled raisins. Desserts such as Apple Pudding with buckwheat cake, Chocolate Caramel Bar with toasted marshmallows and bacon tuile, and Peanut Butter Cheesecake and caramelized bananas with raspberry jam round out the menu. Beverage Director Eleonora Tirapelle [La Bottega del Vino, SD26] works alongside Marshall Altier and Joshua Perez of Spirit House Consultants [Four Seasons Beijing, Mandarin Oriental Hong Kong, The Cosmopolitan Las Vegas] to execute a seasonally-inspired cocktail list and wide array of sipping spirits. Curating a rotating selection of brown liquor with a heavy tilt towards local craft spirits, Black Barn will offer traditional Northeastern staples such apple brandies, American whiskies, and esoteric rums featured in cocktails like Apples & Orchards Punch (Brooklyn Gin, Laird’s Bonded Apple Brandy, apricot brandy, apple bitters and sparkling wine), Bad Seed (Mellow Corn American Whiskey, cayenne, salt and sugar), and Treestand (Grouse Blended Scotch, Warwick Valley Sour Cherry Cordial, lemon and ginger beer). The globally-inspired wine program focuses on regions from California and France to South Africa and Lebanon, with a wide range of price points. With a selection of over 40 varieties of sparkling wine and champagne, higher end pours by the glass are available through the Coravin™. Black Barn will also offer wines on tap for $10 a glass, with selections ranging from Chilean Malbec to Cabernet Franc from the Finger Lakes in upstate New York. Designed by Mark Zeff, the restaurant opens to the bar and café area, seating 60 surrounded by more than 20 barn sash windows lit from behind. Raw granite countertops, industrial light fixtures, and bar stools featuring hand-stitched Spanish Leather make up the expansive bar. Small café tables of coarse wood and iron detailing are paired with plush locally-crafted banquets of deep blue Belgian linen upholstery. 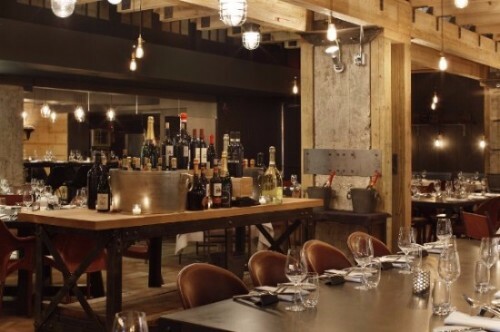 Towards the back of the space, the main dining room features unfinished oak floors, and one-of-a-kind antiques—such as industrial farm equipment and vintage tools—are found throughout the restaurant. Deep brown and charcoal black wooden tables are topped with perforated-steel candle-holders and steel T-bar utensil rests. Adding to the modern, farmhouse atmosphere, custom-designed furniture of rough-hewn wood and steel look into the open kitchen, which serves as the focal point of the dining room. Dozens of lanterns and fixtures sourced from European factories are hung by chain and woven between the ceiling’s immense wooden rafters, mimicking the glow of an evening in a country barn house on Long Island’s East End. Four private dining rooms, uniquely reflective of the restaurant’s aesthetic, accommodate 10 to 100 diners. Black Barn is open for dinner Monday through Wednesday from 5:30pm-10:30pm, and Thursday through Saturday from 5:30pm-11:00pm. For more information or reservations, call 212-265-5959 or www.blackbarnrestaurant.com. Interior of Black Barn Restaurant. Grilled Corn Salad with arugula , avocado, tomato and buttermilk. 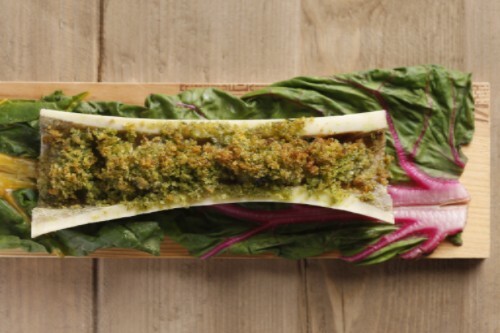 Bone Marrow with manila clams, lemon-herb crumb and shallot reduction. 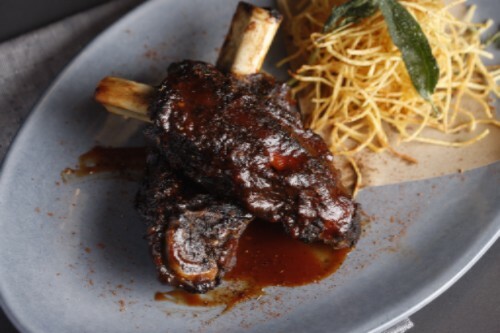 BBQ Beef Ribs with orange-chipotle rub and shoe string fries. 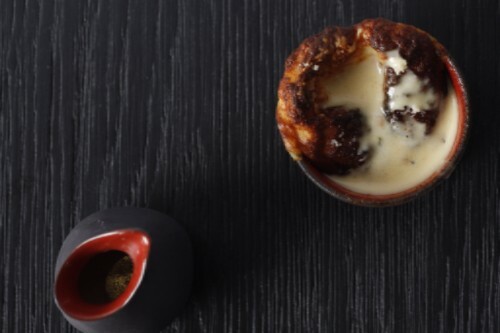 Tarentise Cheese Souffle with speck-chive cream.